Introduction: With the introduction of tooth-colored restoration material, the usage of amalgam has reduced over years. However, results regarding toxicity and health concerns are conflicting. Based on the concept of recycle and reuse, we previously used an ayurvedic method for purification of excess mercury obtained from dental operatory. In the present study, we aimed to evaluate the properties of dental amalgam using commercially available and ayurvedically recycled mercury. 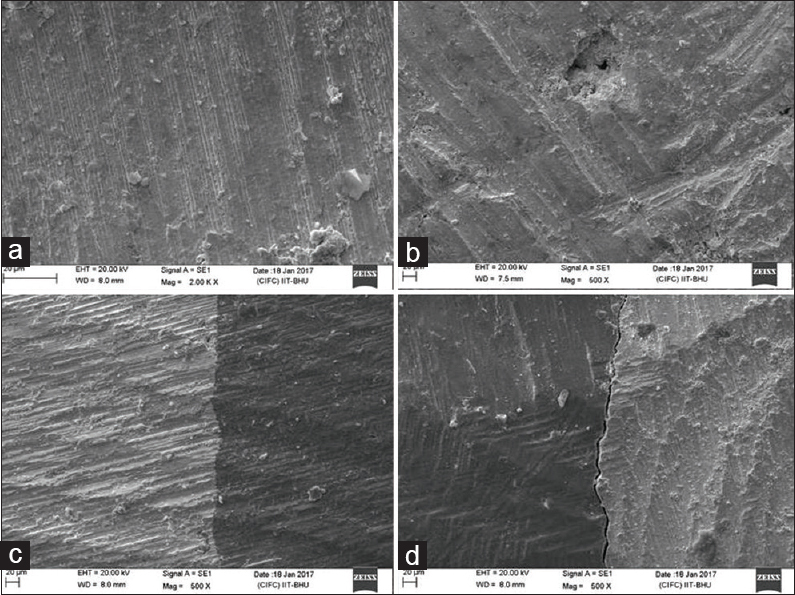 Materials and Methods: Samples were prepared for analysis of mean compressive strength, Vickers hardness number, and coefficient of friction dental amalgam using commercially available and ayurvedically recycled mercury. Further analysis was done using scanning electron microscopy. The data were presented on Microsoft Excel Spreadsheet 2013 and statistical analysis was done on IBM SPSS software (IBM Analytics) and OriginPro 8 software. Results and Conclusion: No statistically significant difference was found in properties of dental amalgam prepared using commercially available and ayurvedically recycled mercury. Although not statistically significant, early compressive strength and hardness of amalgam using ayurvedically recycled mercury were comparatively higher, which may be attributed to residual amounts of silver, tin, and copper acting as nucleating agent for faster setting reaction. Dental amalgam has served the dental profession well for more than 150 years. It has been stated that in terms of economics and longevity, there is no better alternative to amalgam. By virtue of its high compressive strength, it is mainly used for restoration of posterior teeth. Although its usage has decreased in private clinical practice, it is still used in dental schools and is also a material of choice when the patient cannot afford costly dental treatment. It has recently been found that in Canadian population, the mean urinary mercury concentrations were significantly lower than the values considered to pose any risks for health. Similarly, no systemic genotoxicity was observed in an Indian cohort due to the components of amalgam restorations released during its placement and chronic use. Further, no significant link has been found between the usage of mercury with diseases such as multiple sclerosis and Alzheimer's disease. The American Dental Association has endorsed amalgam as being safe for pregnant women. The major limitations are its poor esthetics, no bonding with tooth structures, and disposal of excess mercury and amalgam waste. In a preliminary attempt, we used samanaya shodhana (purification) process from ayurvedic text (Rasa Shastra) for management of excess mercury obtained from dental clinics. With the use of lime powder, fresh garlic cloves, and rock salt, the excess mercury collected from dental operatory was purified. The effectiveness of purification was tested by inductively coupled plasma mass spectrometry (ICP-MS), and we found that amount of silver, tin, and copper markedly reduced after samanya shodhana. In the present paper, we attempted to compare the properties of amalgam using commercially available and ayurvedically recycled mercury to testify if recycled mercury yields dental amalgam at par in properties with dental amalgam using commercially available mercury. Furthermore, the microstructure was analyzed using scanning electron microscope. The study was conducted in the Conservative Dentistry and Endodontics unit in collaboration with Departments of Metallurgical and Mechanical Engineering over a period of 2 years. Prior approval was obtained from the Departmental Research Committee. To create the samples for estimating compressive strength, we used cylindrical plastic molds with 6 mm internal diameter and 8 mm height. Triple distilled mercury (Deepak Enterprises, Mulund, Mumbai, Maharashtra, India) was triturated with zinc-free DPI Alloy (The Bombay Burmah Trading Corporation Ltd., Mumbai, Maharashtra, India) to prepare a homogenous mass. This amalgamated mass was squeezed in chamois leather and condensed into the mold using a stainless-steel instrument with the diameter less than the internal diameter of the mold. Fifteen samples were prepared for measuring the samples' compression strength of the control specimen (Group 1). Similarly, 15 specimens were prepared using mercury recycled by samanya shodhana (Group 2). These samples were stored in an incubator maintained at 37°C ± 1°C until used. Three samples were used from each group for estimation of compressive strength 1 h after the amalgamation. The subsequent measurements were taken on days 1, 4, 7, and 10. The compressive strength was measured by Instron Universal testing instrument (Model 4206; INSTRON Ltd., Buckinghamshire, England) which had a computer system. For measurement of Vickers hardness (HV), disc-shaped specimen was prepared with a diameter of 10 mm using both commercially available mercury and recycled mercury. One end of each sample was first manually ground by the sandpaper No. 120, followed by 180, 220, 400, and 800. The final polishing was done using pumice slurry. All the samples were stored in an incubator at the temperature of 37°C ± 1°C until used on days 1, 4, 7, and 10. On each day, three readings were obtained for both the groups and mean was calculated. The discs were polished every time before obtaining the readings. The measurement of the HV was done using Auto Turret Digital Micro HV Tester (Vertex, Mumbai, India). Here, a square-based pyramid is pressed on the surface of polished amalgam discs. The impression obtained was square shaped. HV is computed as load divided by the projected area of indentation. The length of the diagonals of the indentation was measured and averaged. For checking the friction and wear behavior, occlusal surface of crowns of extracted molar was flattened using diamond cutting tips and crowns of teeth were embedded in plaster of square brick shape of dimension 1.5 cm × 1.5 cm × 0.3 cm. Test samples were made using both commercially available and recycled mercury in cylindrical shape of dimensions 12 mm height and 6 mm diameter. The samples were stored in an incubator at 37°C ± 1°C until used on day 7. Reciprocating sliding wear and friction monitor (Magnum Engineers, Bengaluru, Karnataka, India) were used and coefficient of friction and total weight loss of each sample was assessed. Poor (Score 1): Only one wall shows close adaptation. Score 3: >4 voids per 3 1000× fields. The data were presented on Microsoft Excel SpreadSheet 2013 and statistical analysis was done on IBM SPSS software (IBM Analytics, Armonk, New York, U.S.). Compressive strength and HV were compared between two groups using Levene's test for equality of variances and t-test for equality of means. Graphing and data analysis for tribology of both the groups was analyzed using OriginPro 8 software (OriginLab Corporation, Northampton, Massachusetts, USA). Comparison of microstructure was done using Pearson's Chi-square test. Mean compressive strength (MCS) for Group 1 was estimated after 1 h and on days 1, 4, 7, and 10 and compared to the values obtained for Group 2 [Figure 1]a. MCS in Group 1 after 1 h, and on day 1, 4, 7, and 10 were 59.39, 301.47, 300.47, 300.20, and 299.17, respectively (in MPa). For Group 2, the values of MCS were 63.38 (after 1 h), 301.90 (on day 1), 293.13 (on day 4), 301.33 (on day 7), and 297.70 (on day 10). [Table 1] shows the results most relevant to independent sample t-test providing two sets of information: (1) Levene's Test for Equality of Variance and (2) “t”-test for equality of means. No statistical significant difference was seen in MCS between the two groups after 24 h and on days 1, 4, 7, and 10. 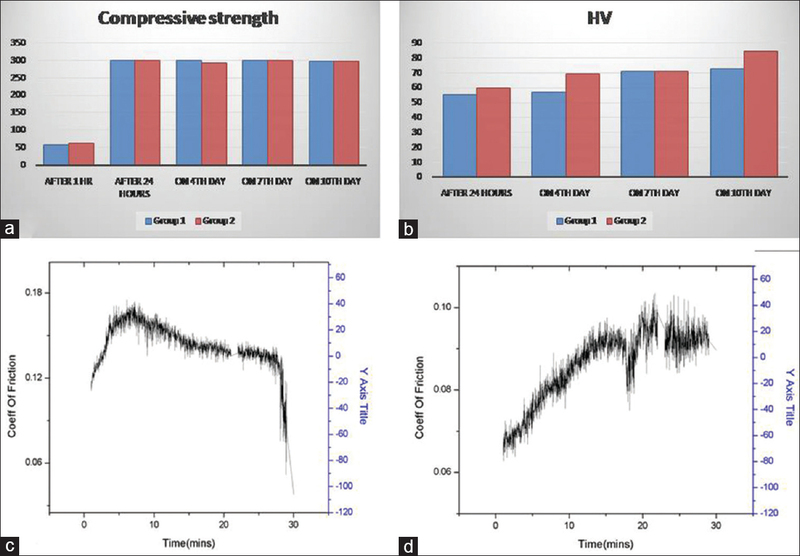 Mean HV (MHV) for Group 1 was estimated on days 1, 4, 7, and 10 and values were compared with Group 2 [Figure 1]b. MHV in Group 1 on day 1, 4, 7, and 10 was 56, 57, 71, and 73, respectively. For Group 2, the values of MHV were 60 (on day 1), 70 (on day 4), 72 (on day 7), and 85 (on day 10). [Table 2] shows the results most relevant to independent sample t-test for comparison of HV between the two groups. The table provides two sets of information: (1) Levene's Test for Equality of Variance and (2) “t”-test for equality of means. Although the values recorded for Group 2 was comparatively higher than Group 1, no statistical difference in MHV between the two test groups on days 1, 7, and 10 (P > 0.05). However, it was interesting to note that on day 4 HV of Group 2 was significantly higher than HV of Group 1 (P < 0.05; df 4). It was found that Group 1 showed a comparatively higher weight loss and lower coefficient of friction as compared to Group 2. Detailed values are shown in [Table 3] and [Figure 1]c and [Figure 1]d.
[Figure 2] shows scanning electron microscopic photomicrographs from representative areas of acceptable restorations and void & gaps in the restorations. No statistically significant difference was seen in marginal adaptation score and number of voids in restoration between two study groups (P > 0.05) [Table 4] and [Table 5]. Although it was not initially intended, we checked compressive strength of dental amalgam using commercially available mercury and ayurvedically recycled mercury 1 year after initial values. Samples were prepared as mentioned above and values were recorded after 1 h and 24 h since maximum gain in compressive strength is seen during first 24 h. After 1 h, MCS in Group 1 was 60.40 and it rose to 307.13 after 24 h. For Group 2, the values of MCS were 61.65 (after 1 h) and 309.21 (on day 1). [Table 6] shows the results most relevant to independent sample t-test. It was observed that after 1 h and 24 h, there was no statistical difference in compressive strength between the two groups (P > 0.05). Mercury release from amalgam restoration and consequent toxicity has been a matter of concern. Although it was found that urine mercury level in a study group was too low to pose health risks, Zwicker et al. were more in favor of alternative restorative materials. The conclusion was deducted on the basis of results that removal of amalgam fillings reduced the self-reported symptom deterioration and increased the possibility of symptom improvement in comparison to people who retained their amalgam fillings. In contrast, Nicolae et al. opined that mean urinary mercury concentrations in Canadian population are significantly lower than the values considered to pose any risks for health. Similarly, Priya et al. observed no systemic genotoxicity due to the components of amalgam restorations. No differences in neurobehavioral assessments or nerve conduction velocity have been reported among children with amalgam restoration when compared to children with composite resin restoration. Further adding to the information, Miriam Varkey et al. concluded that environmental factors such as fishes collectively overpower the exposure levels from amalgam restorations alone. Thus, based on literature review, we could not find any solid background to ban amalgam restoration from dental profession. One major problem which we came across was disposal of excess mercury. In a preliminary attempt to recycle and reuse the excess mercury, we used a novel procedure of Ayurveda, namely, samanaya shodhana and found that after purification the level of silver, tin, and copper was markedly reduced. Purified mercury showed a level of 119.5 ppm silver, 0.5324 ppm copper, and 0.3233 ppm tin. Amount of silver, copper, and tin in commercially available mercury, as depicted by ICP-MS, were 11.69, 1.1069, and 0.1045, respectively (in ppm). In the present study, we compared the properties of dental amalgam using commercially available and ayurvedically recycled mercury to test whether recycled mercury be satisfactorily reused. After 1 h, MCS obtained 59.39 MPa for commercially available mercury which was comparatively less as compared to MCS obtained from amalgam using recycled mercury (63.38 MPa), although there was no statistically significant difference between two groups. It was further observed that the maximum gain in compressive strength was seen after 24 h which is in accordance with the findings of Malhotra and Asgar and Duke et al. who stated that in high copper amalgam the greatest increase in strength is achieved in the period from 1 h to 24 h., Suchatlampong et al. in their study confirmed the aforementioned results and found a significant correlation between the ratio of early compressive strength and the diffraction intensity ratio for γ1 indicating an increase in early compressive strength is mainly dependent on the formation of γ1. This gain in early compressive strength is important from clinical point for assessing resistance of amalgam restoration to early fractures. The values of MCS showed no significant change on 4th, 7th, and 10th day. Rajih et al. showed improvement in wear resistance, hardness, and compressive strength by the addition of oxides of zinc and titanium. Many other similar attempts have been made for the improvement of properties of dental amalgam. Although it was not initially intended, we assessed the compressive strength after 1 year to evaluate whether the purified mercury has a prolonged shelf life or not. We found that even after 1 year, there was no statistical difference in compressive strength between the two groups after 1 h and 24 h (P > 0.05). Furthermore, the obtained values after 1 year were close to the initial values. With regard to HV number, the hardness increased to a maximum of 85 using recycled mercury which was higher as compared to a value of 73 for control. However, the results showed no significant difference except on day 4 where it was noticed that the hardness using recycled mercury was significantly more than controls. Our values were much lower than the values obtained by Rajih et al. and Razavi et al. in their study., This may be due to the fact that there was difference in the alloy used yielding varied results. Despite the fact that there was no statistical difference in compressive strength and HV number between two study groups, the values were comparatively higher using ayurvedically recycled mercury, and this may be attributed to the fact that residual silver, copper, and tin may act as nucleating centers resulting in faster setting reaction and early gain in compressive strength and hardness. In an early study, Tillitson et al. detected the coefficient of friction of dental amalgam with respect to dry bovine enamel and found it to be in a range of 0.180–0.22. The coefficient of friction using commercially available mercury was 0.086 ± 0.009 which was found to be lower than the value of amalgam using recycled mercury (0.144 ± 0.15), but both the values were close to the range provided by Tillitson et al. They also found that the relative abrasive wear of materials follow the order of the hardness of the materials. Although not statistically significant, we found that HV for Group 2 was higher than Group 1 and this corresponded with their values of coefficient of friction and amount of weight loss during estimation of friction coefficient. It was stated that a pair of materials exhibiting a higher value of coefficient of friction might offer greater frictional resistance under identical conditions, hence should be the material of choice for restoring the buccal or guiding plane surfaces of a tooth, where indicated. Thus, dental amalgam restorations using shodhit mercury with higher MCS, HV, and coefficient of friction and lesser weight loss might serve even better than amalgam restorations triturated with commercially available mercury. We further processed samples for scanning electron microscopy for evaluation of marginal integrity and voids within the restoration. Restorations with recycled mercury matched commercially available mercury as no statistical significant difference was found between the two groups. Based on the concept of recycle and reuse, we thus conclude that excess mercury from dental operatory can be satisfactorily recycled by samanaya shodhana as the process greatly reduce the amount of silver tin and copper as depicted by ICP-MS. After purification, the residual Ag, Sn, and Cu may act nucleating centers causing faster setting reaction and an early gain in MCS and hardness. There was no difference in the properties of the amalgam prepared by commercially available and ayurvedically recycled mercury. Thus, further research is warranted to check if samanaya shodhana is feasible on a larger scale and in vivo use of ayurvedically recycled mercury. Berry TG, Summitt JB, Chung AK, Osborne JW. Amalgam at the new millennium. J Am Dent Assoc 1998;129:1547-56. Priya EL, Ranganathan K, Rao UD, Joshua E, Mathew DG, Wilson K, et al. A study of sister chromatid exchange in patients with dental amalgam restorations. Indian J Dent Res 2014;25:772-6. Nicolae A, Ames H, Quiñonez C. Dental amalgam and urinary mercury concentrations: A descriptive study. BMC Oral Health 2013;13:44. Shenoy A. Is it the end of the road for dental amalgam? A critical review. J Conserv Dent 2008;11:99-107. Pandiar D, Baranwal HC, Chattopadhyay K, Choudhary AK, Ganesan V, Sonkar PK. Utilization of Samanya Shodhana in the purification of excess mercury obtained from dental operatory – A preliminary study. Int J Ayurveda Pharm Res 2018;6:8-13. Zwicker JD, Dutton DJ, Emery JC. Longitudinal analysis of the association between removal of dental amalgam, urine mercury and 14 self-reported health symptoms. Environ Health 2014;13:95. DeRouen TA, Martin MD, Leroux BG, Townes BD, Woods JS, Leitão J, et al. Neurobehavioral effects of dental amalgam in children: A randomized clinical trial. JAMA 2006;295:1784-92. Miriam Varkey I, Shetty R, Hegde A. Mercury exposure levels in children with dental amalgam fillings. Int J Clin Pediatr Dent 2014;7:180-5. Malhotra ML, Asgar K. Physical properties of dental silver-tin amalgams with high and low copper contents. J Am Dent Assoc 1978;96:444-50. Duke ES, Cochran MA, Moore BK, Clark HE. Laboratory profiles of 30 high copper amalgam alloys. J Am Dent Assoc 1982;105:636-40. Suchatlampong C, Goto S, Ogura H. Early compressive strength and phase-formation of dental amalgam. Dent Mater J 1995;14:143-51. Rajih AK, Al-Sultani KF, Al-Kinani MA. Mechanical properties improvement of dental amalgam using TiO2 and ZnO. Life Sci J 2015;12:86-90. Razavi SH, Mirdamadi S, Hormozi M. Investigating the physical and mechanical properties of high-copper and silver dental-filling amalgam alloys. Iran J Mater Sci Eng Winter 2011;8:40-7. Tillitson EW, Craig RG, Peyton FA. Friction and wear of restorative dental materials. J Dent Res 1971;50:149-54. Ali M. The measurement of co-efficient of friction between cast Co-Cr alloy and guiding plane materials – A pilot study. Pak Oral Dent J 2002;22:63-6.